Lowndes County is a county located in the state of Georgia. Based on the 2010 census, the population was 109,233. The county was created December 23, 1825. The county seat is Valdosta. The county is named in honor of William Jones Lowndes (1782-1822), a prominent figure in the affairs of South Carolina throughout the formative years of the United States. 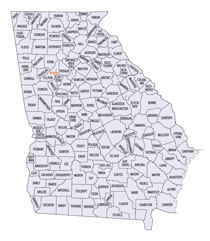 Lowndes County is included in the Valdosta, GA Metropolitan Statistical Area. It is located along the Florida border. Lowndes County is named for William Lowndes, a South Carolina statesman who died shortly after being nominated for Vice President of the United States. Lowndes County is named for William Lowndes, a South Carolina statesman who died shortly after being nominated for Vice President of the United States. The county seat, Valdosta, was named for Governor George Troup's plantations, named for an Italian alpine valley, Val D'Osta. The first county seat, Franklinville, was established in 1828. In 1837, Troupville became the county seat until the railroad surveyors came to the area. The citizens of Troupville decided to pickup and move the town four miles to ensure its economic prosperity. 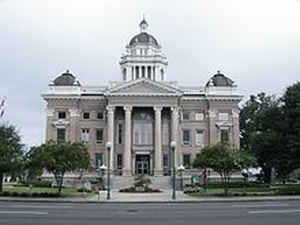 The town was then renamed Valdosta in 1860 and became the new seat of county government. Valdosta now has three National Register Historic Districts: Downtown, Victorian Fairview, and Patterson Street. The county's numerous opportunities for recreation include Langdale Park, the county's newest park. 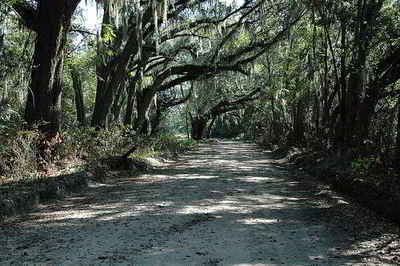 The 5,000-acre Grand Bay Wildlife Management Area, 10 miles north of Valdosta, is the second largest cypress-blackgum bay in Georgia after the Okefenokee Swamp. Visitors to the Wildlife Management Area can fish, canoe, birdwatch, hike, camp, and hunt. Moody Air Force Base is located in the county. It was named for George Putnam Moody who died in an air crash in 1941. Tours are also available of many of the city's historic homes, such as the Crescent, which serves as the headquarters for the Valdosta Garden Center, and the Barber Pittman House, which was home to the first bottler of Coca-Cola outside of Atlanta. Valdosta is the business and retail hub for south Georgia and north Florida. Valdosta also has a symphony orchestra composed of local professional musicians, Valdosta State University faculty and students, as well as guest artists. Valdosta was the boyhood home of John Henry (Doc) Holliday from 1866-1972. The actual house was purchased and restored in 1981 for use as a residence. As reported by the Census Bureau, the county has a total area of 511 square miles (1,320 km2), of which 496 square miles (1,280 km2) is land and 15 square miles (39 km2) (2.8%) is water. Lowndes county is located in south Georgia.The county is in the Suwannee River basin. Southeast: Echols County; Hamilton County, Fla.
Valdosta State University was originally founded in 1906 as South Georgia State Normal College for Women, and became part of the University of Georgia system in 1950.